Tag Archive | "rescue operations"
The 33 miners trapped for almost two months in an underground cave in Chile could be rescued earlier than expected after rescuers drill closer to their location according to Chile’s mining minister, Laurence Goldborne on Friday. The miners have been trapped about 2,300 feet under the ground since the roof of the mine collapsed on August 5. Several people around the world monitored every progress from the rescue operations as they fight for their survival. The incident had also drawn support from Pope Benedict, as well as the soccer players from the World Cup. 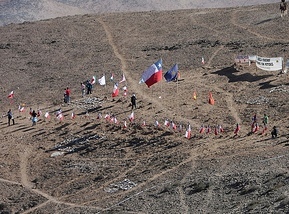 Originally, the Chilean government announced that the miners might not be rescued until November. But, because of the surge in drilling, they could be rescued durring the second half of October that is two weeks from now. The drill had already reached a depth of 984 feet, which is halfway to its goal. It is advancing deeper into the ground at around 243 feet per day. A metal cage designed by the Chilean navy will be used by the rescuers to get all men out one at a time. It is a 925-pound capsule and 21 inches wide, painted with the colors of the Chilean flag. In preparation, the miners have started exercising for the trip back to the surface, the doctors said. The trapped men, which include a first-time miner, a Bolivian immigrant and former soccer star, have also started sending up the gifts that were sent to them through small channels over the past weeks.